The expression, "When the cat's away, the mice will play" applies to the hands at the Darwin Ranch, when the foreman goes into town on business. Well, evolutionists are proposing something similar: when the dinosaurs took a dirt nap, mammals felt free to evolve faster. Of course, there was also a large amount of mammalian extinction going on as well. Scientists examined fossils of certain mammals, then presented a hypothesis based on their presuppositions of Earth being mighty old, evolution as a fact, and others. 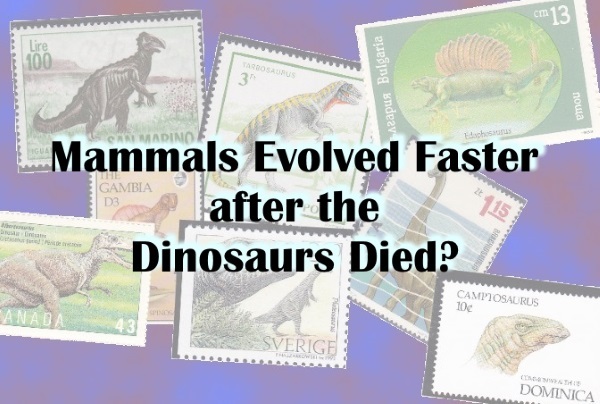 They neglected other areas of "rapid evolution" that conflict with this hypothesis, and included the too-common conflation between change and dust-to-dinosaur evolution. If they had cognated on actual speciation and bothered to look at the much better Genesis Flood models of creationary scientists, they'd have a much better idea of what happened, and that it happened much more recently than they'll accept in their worldview. In a recent news article published in Science Daily, researchers made the claim that evolution of the placental mammals sped up three times faster in the 10 million years following the extinction of the dinosaurs at the end of the Cretaceous geological period. Prior to that event, conventionally dated at 66 million years ago, evolution of Eutherian mammals from which placental mammals supposedly arose was assumed to be constant. The findings of the research team from the University College of London were that early placental mammals took advantage of the dinosaur’s extinction at the end of the Cretaceous and, without these predatory pressures, rapidly evolved into new forms. Using this new extrapolation, the researchers concluded that the last common ancestor for placental mammals lived at most about 69 million years ago, compared to 89 million years, under a slow, constant rate of evolution paradigm, based on Bayesian dating methods. To read the rest, click on "Did Life Evolve Faster Before or After the Extinction of the Dinosaurs?"